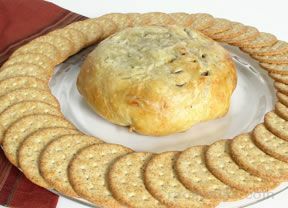 These savory cookie-like rounds are a wonderful accompaniment for vegetable or fruit slices or a variety of cheeses. Line the baking sheets with parchment paper or silpat. 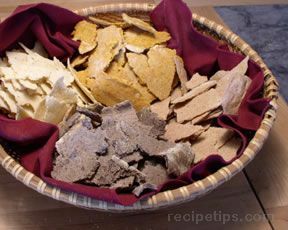 Mix flour, cheese, salt, garlic and pepper in a food processor or blender. Add butter, using small pulses, process until dough begins to come together. Divide the dough in half and roll each half into a 12 inch log. Cut each long into 1 inch slices. Using your hands, roll each piece into a ball. 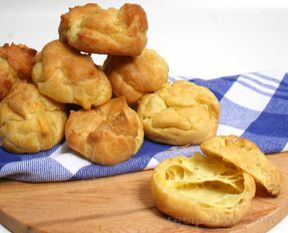 Arrange the dough balls onto a prepared baking sheets, spacing them approximately 1 1/2 inches apart. Take a glass with a two inch round bottom and dip it into flour, then press each ball into a two inch diameter round. 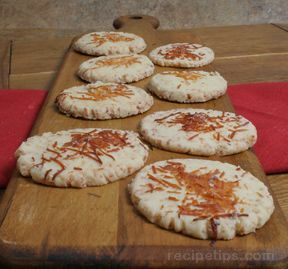 Sprinkle each round with parmesan or Asiago cheese. Bake the rounds until the tops are dry and the bottoms are golden brown, approximatley 20 minutes.